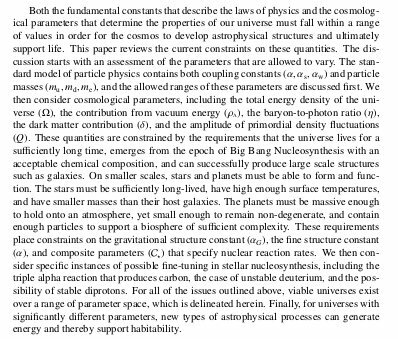 This entry was posted on March 25, 2019 at 12:11 pm and is filed under The Universe and Stuff with tags arXiv:1902.03928, Cosmology, fine-tuned Universe, fine-tuning, Fred C. Adams, Universe. You can follow any responses to this entry through the RSS 2.0 feed. You can leave a response, or trackback from your own site. I reviewed that book a while back. Essential reading, even if you don’t agree with everything. And you won’t, since the two authors don’t agree on everything. I think that this is a very important point: the existence of fine-tuning is independent of the mechanism used to explain it. Some people avoid the topic, or deny that fine-tuning exists, because they don’t like any of the mechanisms.